Puppy Mind is a picture book for both children and adults. It’s about a boy who has a puppy mind that always wanders away. The deck of cards include exercises and practices that can help kids to calm their mind and body, pay attention, feel happier and confident, become more self-aware, connect with others and have fun. It encourages kids to practice mindfulness skills each time they win a hand. The cards are designed to help children feel grounded, improve focus,find calm, practice loving-kindness and relax. It has easy-to-follow steps for children of all abilities. One of Thich Nhat Hanh’s best known and most innovative meditation practice, Pebble meditation. It is a playful and fun activity for children. The book is lively in spirit and humor. It’s about the special bond between a grandparent and grandchild. It also shows the joy of learning new things, such as tai chi and yoga for all ages. In this story, Arun Gandhi, Mahatma Gandhi’s grandson, tells the story of how his grandfather taught him to turn darkness into light. The book is filled with unique three-dimensional collage paintings. The book describes how many different ways people all over the world celebrate the sunrise. About a young boy and his old teacher who teaches him how to listen to sounds and songs of the natural world. The listening walk teaches children to walk and not talk and not hurry. It encourages them listen to a world of wonderful and surprising sounds. A book about silence in the world that we live in. Elliot discovers something extraordinary about an apple: the power of mindfulness. It encourages to children to carefully and attentively look, taste, smell, feel, and even listen to ordinary everyday stuff, like anthe apple. A book filled with step-by-step simple instructions for yoga poses and poems. It teaches children and adults stretching, posture, and breath work to help their bodies prepare for a restful sleep. A book that inspires young dreamers to be doers. A story about a girl named Rae who learns what it means to be an entrepreneur. This book is for teens, it teaches them how to shape your brain, build its strengths, and avoid dangers with the decisions they make. It’s a brain owner’s manual. Children are then encouraged to give their own amygdala a superhero name; thus encouraging children to take ownership of themselves and their feelings. 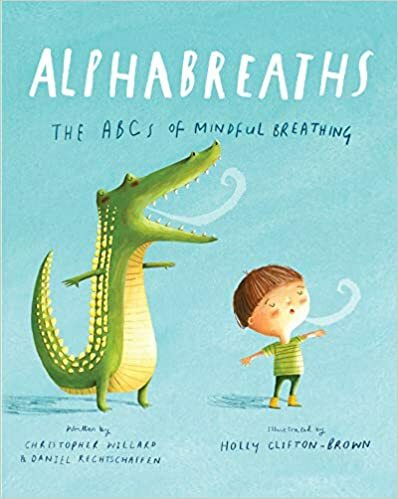 In Alphabreaths, children will learn their ABCs and the basics of mindfulness through playful breathing exercises. 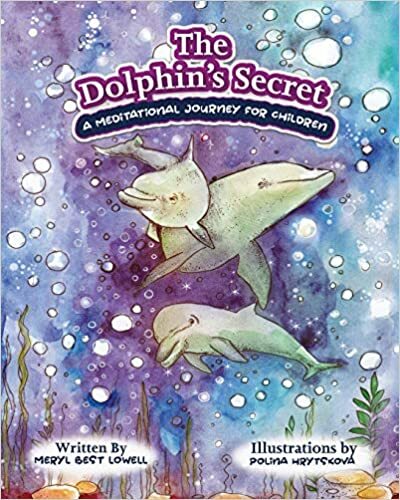 The story weaves in mindfulness techniques of Yoga Nidra, an ancient form of meditation, which will help children have a direct experience of peace and relaxation. Mindfulness meditation for kids of any age. The book helps kids to learn simple exercises to help them manage stress and emotions, find focus, and face challenges. A story about finding yoga and happiness. This book helps children identify their feelings and helps them to better understand them. A book to help parents, teachers, and children talk about anger. kids will see what Sophie does when she gets angry. What do you do? Peaceful Piggy teaches you what to do when you’re mad, sad, or anxious. The book teaches meditation to stay happy, and make bad days feel easier. A guide through the tantrums and a whole range of children experiences. Perfect for parents and children, you can laugh, learn, and read with them! A thought-provoking look at the world from the eyes of a small child. It offers a youthful perspective on how children are affected by war, racism, environmental issues and other important topics. The story is about a dolphin name Ripple and a shark named Snark. The book shows how to be happy and how a smile is contagious. The book explores physical, social, emotional, and cyber safety. It tells the story of a young boy and his friends on an outing where they resist peer pressure, look out for one another, and listen to their inner voices to know the right things to do. The book teaches children about mindfulness. It connects them to others and to their own feelings. Breathe Like a Bear is a beautifully illustrated collection of mindfulness exercises designed to teach kids techniques for managing their bodies, breath, and emotions. This story is about an average girl who decides to pick some blueberries for her neighbor. The neighbor bakes blueberry muffins and gives plates of them to five other people. This good deed turns into a chain of strangers doing kind things for other strangers. This sweet book tells the story of Brian, a quiet boy who never makes a fuss or much noise at all. He feels invisible compared to the other children who are the center of the teacher’s attention by being loud, or the children with lots of friends who get picked first for sports. This book is about a boy named Nikolai who wants to be a good person, but is not always sure how. His three animal friends help him answer these questions, but they all have slightly different approaches. He eventually learns that the right time is now, the important one is the one you are with, and the right thing to do is good. This book is about a cake, who is, very rude. He never says please or thank you, never listens, and doesn’t share well. One day a giant cyclops takes the rude cake and wears him as a hat. The cyclops has great manners, but the cake hates being a hat. CJ spends most of the journey asking “How come…?” questions about everyone and everything. His grandmother answers each question with patience and eventually they leave the bus to volunteer at a soup kitchen. In this book, we see a young boy dreaming about getting a pair of really cool shoes. Unfortunately, his family does not have the money for this dream to become a reality. This is about a boy who is having a great summer until Jeremy Ross moves in down the street. Jeremy excludes people from birthday parties and laughs when they strike out in baseball. The narrator’s father makes enemy pie to help defeat Jeremy Ross. This book introduces an idea that everyone has an “invisible bucket.” These buckets are used to hold your good thoughts and feelings about yourself. When you do something kind, you help fill someone else’s bucket. This story is about a zookeeper who is great friends with all of the animals and takes the time out of his day to do what they like with them. One day, he is too sick to go to work and the animals decide to come and visit him. This story is about a new girl at school, named Maya and how Chloe, who has gone to the school for a while, reacts when she arrives. Chloe is not welcoming towards Maya and excludes her from the group games. Maya leaves and Chloe is left feeling full of regret. The book aims to help, encourage, teach, and develop a powerful positive mindset for kids and adults. The main character, Birdy, believes in love, kindness, and staying positive! The book is about a group of friends who experience what it means to be present at school, home, and the beach. It teaches children how to notice when someone needs help, to wait patiently for their turn, and focus on what’s happening now. Nikolai searches for the answers to his three questions. The book is about compassion and being engaged in each moment. The book shows young children how to be kind through simple ways and small acts of kindness. A tale of a young boy and a cow, who is his breakfast guest. It has humorous lessons. The book shows that size is more than a matter of height. It teaches both children and adults about the importance of values over valuables. The story is told from the point of view of a child with Asperger Syndrome. It highlights the triumphs of the his experiences in a day at school. A story of a young boy and girl who explores all the different ways to be green. The book shows ideas on how to be friend to the environment. A book of children singing and dancing about their traditions from all over the world. It encourages children to open their minds to new possibilities and celebrate diversity in people. Sammy’s Next Move is a wonderful story about a snail named Sammy who lives around the world with his parents. He is a ‘third culture kid’, TCK or global nomad. He often moves to new countries and has to change schools and make new friends. the real-life rescue story of Marshall, the Newfoundland dog, and the people aboard the W.F. Marshall in 1877. A familiar book to many, this book tells the heartfelt story of a boy and a tree who loved each other very much, but the boy ends up taking parts of the tree until the tree is worn down into a stump. At the end of the book, the boy (now an old man) just needs a place to sit, so he and the stump sit together. A remarkable story about an 11-year-old cabin boy named Sparks. He takes a journey on the Southern Cross, a pirate ship that is led by Captain Barracuda. A children’s book based on the song traditional Mexican counting song “Un elefante se balanceaba.”. It teaches how to count to five and can also be the perfect bedtime story. A story about 14 year old Willa Havisham who leaves Cape Cod. She ends up in Troy, New York, where she discovers new friends, adventures, and a new meaning of home. A book about ideas. It compares fireflies to ideas and includes practical tips, free space for creativity, and “spark starters”, to help bring their new ideas to life! A rhyming bedtime story about little Sofia befriending the Moon and sets off ona dreamy adventure to visit her friend. An inspiring book on protecting the Earth. A story about the scientist and intergalactic explorer Snutt. Snutt explores the beauty of new worlds and makes new discoveries. The book is a fun and engaging introduction to the human anatomy. It teaches the functions of the brain will empower and teaches each young reader to stretch and grow their Fantastic Elastic Brain! Being mindful won’t take away your problems, but it can help you handle them. In this activity book, kids will learn to settle their thoughts and look inward through a series of fun writing prompts, games, and meditation exercises. This easily digestible guide introduces kids to mindfulness as a way to find clarity, manage stress, handle difficult emotions, and navigate personal challenges. A book full of simple acts of kindness children of all ages can do. Beautiful images and fun activities to help spread kindness and compassion to all! Sign up and download your cheatsheet immediately.